When Willem de Kooning was a struggling young artist and needed money, he would frequently sell a painting or sculpture as quickly as he made it, often bypassing his dealer, Xavier Fourcade. After the artist’s death in 1997, when the Willem de Kooning Foundation needed cash, it, too — like many artists’ foundations — would sell a work from its holdings, but always privately. Now, to raise more than $30 million for an endowment that would support scholarly and educational initiatives, the foundation has decided to sell 10 paintings in a particularly grand way. 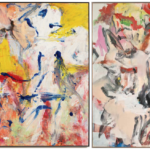 […] Since there is no catalogue raisonné of de Kooning’s work, proceeds from the show will go toward financing the publication of one, a multiyear project that will require hiring a team of scholars. Given the value of de Kooning’s work and the recent problems with fakes by mid-century masters appearing at the top of the market, the lack of a catalogue raisonné is a real issue.